So in case you missed it, we are back to one rotation a year, and that rotation will be in the fall, just as it used to be. But what does it mean? What cards and strategies are impacted? Should I buy now? Should I hold? Well, it’s actually not that earth-shattering an announcement, considering that the old model didn’t have very long to take root. I freely admit that I don’t play a lot of Standard, so this decision was likely a reflection of conversations with R&D, vendors, distributors, local stores, and of course players. I don’t feel the need to parse the words of the announcement, but I do respect that they are listening to concerns and acting when they can. A longer rotation means, for us, a return to what many of us consider ‘normal’ cycles with regard to the prices of cards. I have been watching Gideon, Ally of Zendikar for some time, and considering that a bellwether for what good cards should be expected to do financially. 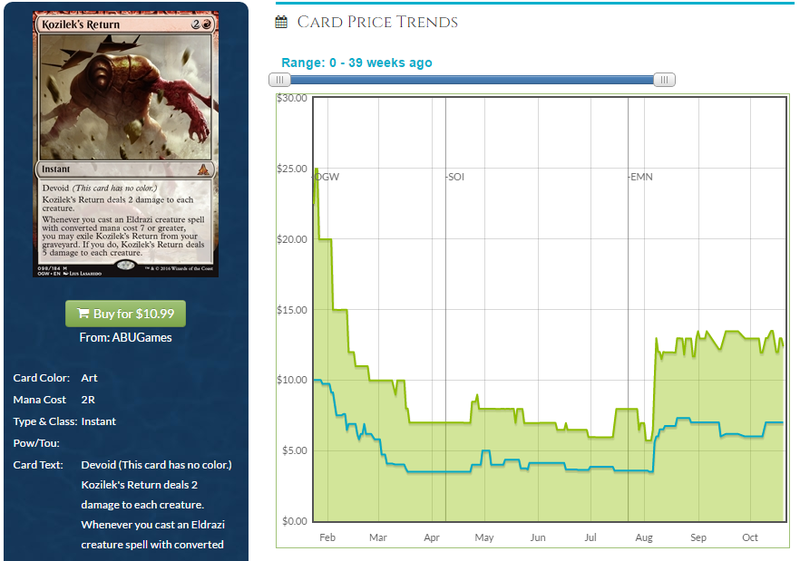 In this case, and in a lot of cases, cards aren’t spiking due to Standard demand. 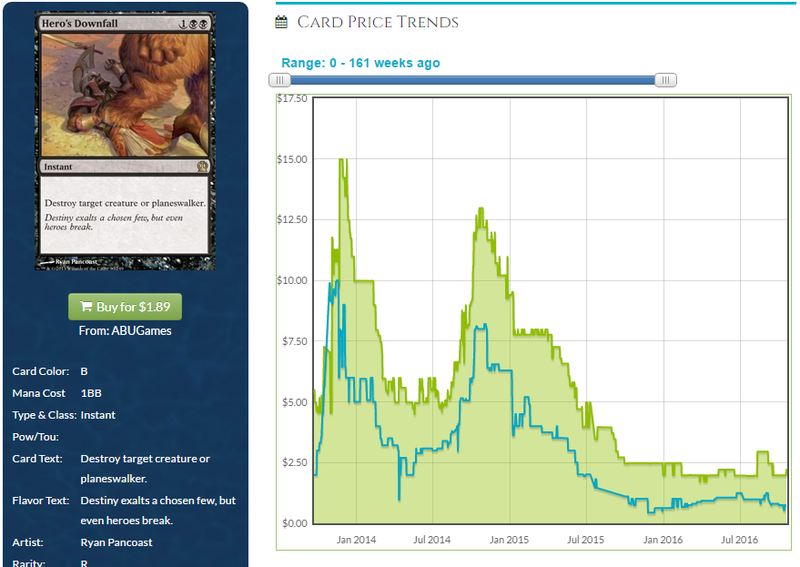 Cards were setting a price early and trickling downward, at different rates depending on how much it’s played. Before the change, there was a point about one year after release when some middling to great cards would spike nicely. My favorite example from recent times was Hero’s Downfall. Mmmm. Pure, undiluted value. That spike at the rise of Mono-Black Devotion. One of the things I love doing is hunting for the value that will be, and lots of us write about it. With the 18-month schedule, it’s very difficult for that spike to happen. Cards are going to rotate out so soon, there wasn’t much time to enjoy your deck, especially for cards released in the second set. Let’s look at Kozilek’s Return. The power of the card, the need for a four-of, and that it was a mythic in a small set, all contributed to the gain in value, but I don’t think it went as high as it could have, because people knew they were getting a card just for the next few months. Now, if you pick up some Gideons or Returns, you’re going to be able to play them until next October, making it a lot more palatable to drop the money on a playset. Gideon is one example, and Return seems likely to pick up a couple bucks, but those aren’t going to grow a lot. I also think that while Liliana, the Last Hope is really well positioned against the swarm of aggressive and tiny creatures in Standard, being at $45 doesn’t leave much area for growth. Ob Nixilis, Reignited – $4.90 – I know he’s an easily available foil in the Duel Deck that dropped in September, but this is a very cheap price for a strong mythic planeswalker. He does everything a control deck wants, and at worst, he’ll replace himself immediately before getting answered. Being in the Duel Deck is going to seriously cap his value, but cheap planeswalkers are always a solid investment. Quarantine Field – $1.13 – It’s a bad deal at four mana, but good at six and game-breaking at eight. A dollar mythic is always going to get my attention, though I think Fragmentize puts a top on how high this can go. Goblin Dark-Dwellers – $1.17 – This was the buy-a-box promotional card so there’s more of them, but this is a card good enough to show up in Modern. I’m a big fan of cards with nowhere to go but up, and we just got a good lesson in how good replaying spells can be, thanks to Torrential Gearhulk. Having flash makes the Gearhulk better, but I like this at a buck. Oath of Nissa – $2.50 – It’s a rare from a small set that gets played as a four-of. I like getting these and waiting for them to go up to the $4-$5 range. Cryptolith Rite – $1.37 – Have we forgotten how good these swarm decks can be? This is a real enabler of a card that has good potential to spike. Declaration in Stone – $5.39 – An excellent candidate to go up now that it’s legal for six more months. If Prized Amalgam decks go up as well, then this or Descend upon the Sinful will really spike. Ishkanah, Grafwidow – $8.41 – This is a very powerful card, and mythics from this set stand to do very well with the extra time in Standard. I’d look for this to spike by $5 or more when it hits big. Tamiyo, Field Researcher – $11.41 – There’s two other mythics from this set that are $20+ and all it’s going to take is one good set of results at an SCG open or a GP for this to spike. The supply is rather low (remember, this lost time being drafted due to Conspiracy: Take the Crown) and this could easily be the third card to hit that price. Shadows Over Innistrad and Eldritch Moon don’t get any extra time in Standard. They rotate at the same time they always did. Yup David, u r right and Cliff is incorrect. Shadows and Eldritch Moon gain no advantage or increased time in Standard due to the rotation change. Just BFZ and Oath, and with those cards legal longer it might supress some of the SOI and EMN cards. Would have been more interesting if Cliff mentioned World Breaker, a card that exiles a land, artifact, or enchantment on cast. I think all of your picks are spot on and at very attractive lows. I would never “buy-in” to all of them, but I definitely have my eye on at least half of these. I own speculative copies of 2 of these cards already and now I’m thinking about a 3rd and 4th looking at these lows considering the new/old rotation schedule. Has there been any word on if they are changing the new REDEMPTION schedule? That is still going to affect some sets in some wonky ways. Eldritch Moon has 2 years to be redeemed or something and Kaladesh only has months? Not many articles on how this is going to DRASTICALLY affect paper foil prices due to reduced redemptions? Should we be speculating on Kaladesh Foils for this reason? Or is that a trap due to the Masterpiece series. Sorry for the can of worms, but its something to think about.